The GT-001 packs the acclaimed amps and effects of the flagship GT-100 Version 2.0 in a stylish desktop processor for your home studio or mobile rig. Its small size fits easily into any workspace, while the intuitive interface makes it simple to dial up world-class tones for recording and practice. In addition to the guitar input, an XLR mic input is included for capturing vocals or acoustic instruments, and the built-in USB audio/MIDI interface provides a direct connection for creating music with your favorite DAW. Like the GT-100, the GT-001 offers powerful sound creation possibilities with dual amps and effects chains and flexible routing options. On top of that, a newly developed guitar-to-MIDI function lets you have fun with Guitar Friend Jam and other computer programs from a normal guitar input—no special pickup required! Available as a free download, the BOSS TONE STUDIO software provides a cool graphical interface for tweaking tones from your computer, plus access to BOSS TONE CENTRAL for free studio-ready patches and much more. Under the hood of the GT-001’s stylish, streamlined body is a full-featured BOSS multi-effects processor with premium tone. Its COSM amps and effects are equivalent to the GT-100 with Version 2.0 software—BOSS’ top-of-the-line processor for stage performers—and patch data can be shared between the two units. Dual effects chains allow you to create sophisticated tones with two amps and series/parallel effects routings, providing pro-level performance for all your music productions. Advanced parameters include a channel divide function that lets you switch effects chains manually or according to frequency or playing dynamics, and adjustable left/right mixing for flexible audio capture in your DAW. 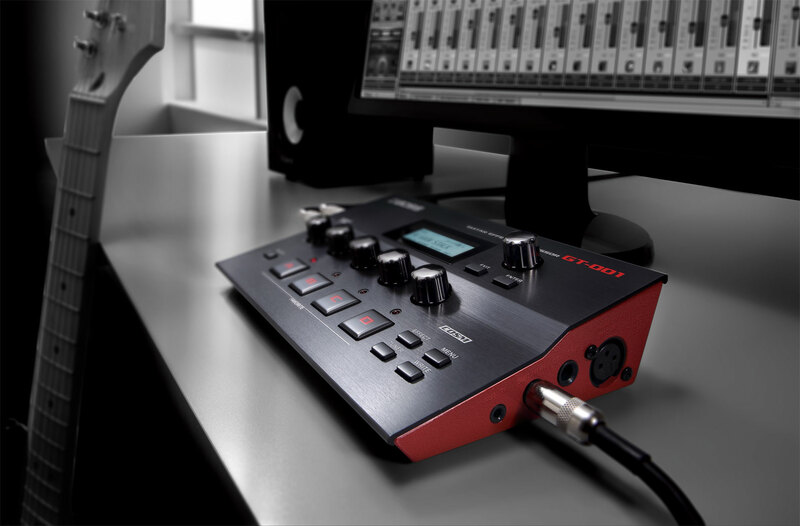 Via a single USB cable, the GT-001 functions as a high-quality audio interface for your Mac or Windows computer. It’s easy to capture great amp and effects tones directly into your DAW, and four audio channels provide lots of flexibility for recording, re-amping, and mixing. For example, you can listen to the GT-001’s amps and effects while capturing an unprocessed signal in your DAW, simultaneously record processed and dry tones on separate tracks, and listen to your mix while re-amping and adjusting guitar tones through the GT-001. In addition, the ability to power the GT-001 with either the included AC adapter or a computer’s USB bus offers great convenience for home setups, studio sessions, and mobile recording with a laptop PC. The GT-001 is not just a guitar processor—you can also connect a mic to capture vocal and acoustic instrument performances into your DAW. The XLR mic input is equipped with phantom power, allowing you to use a condenser mic for top recording quality. Specially designed patches for vocals and acoustic guitars are included, providing great sound for monitoring and tracking. The GT-001 also has a stereo aux input, perfect for connecting a smart phone or drum machine for jamming when you’re not connected to your computer. 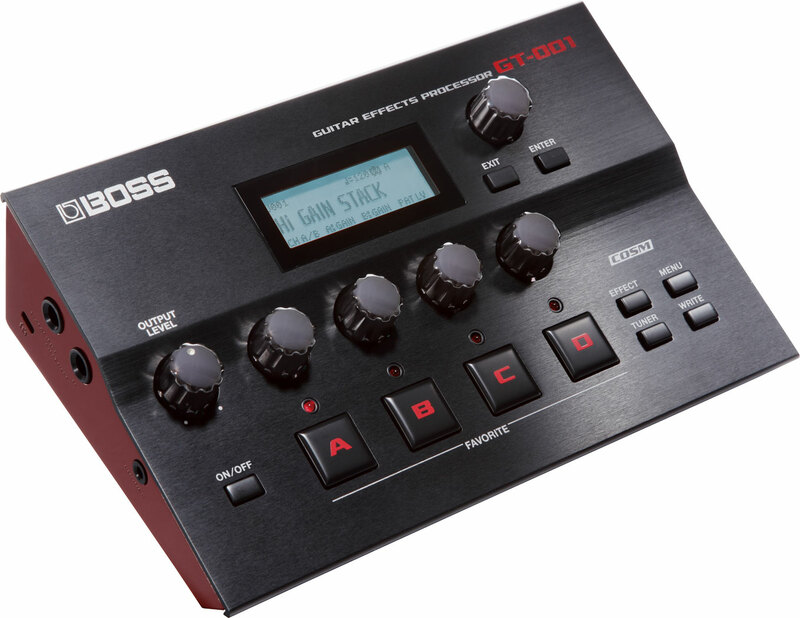 The GT-001 includes a monophonic guitar-to-MIDI function that allows you to play soft synths and other MIDI instruments in your computer from your normal axe, with no special pickup required. 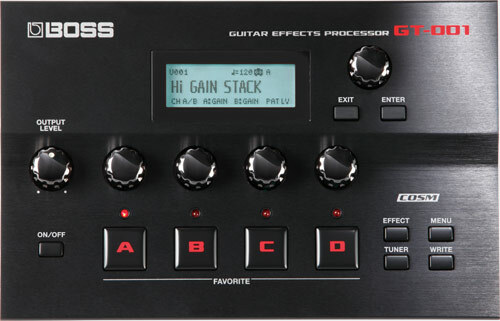 Powered by newly developed BOSS technology, this cool and convenient function is great fun when working with Roland’s free Guitar Friend Jam software, and also lets you experiment with using your guitar to create MIDI sequences in music production software. Available as a free download for Mac or Windows, BOSS TONE STUDIO gives you an intuitive graphical interface for creating and editing GT-001 effects patches from your computer via USB. The software also makes it easy to organize and archive patches, and to load them as needed for different songs and styles. If your computer has Internet access, BOSS TONE STUDIO provides an integrated connection to the BOSS TONE CENTRAL website, where you can preview and download free patches created by top guitar pros directly into the GT-001. 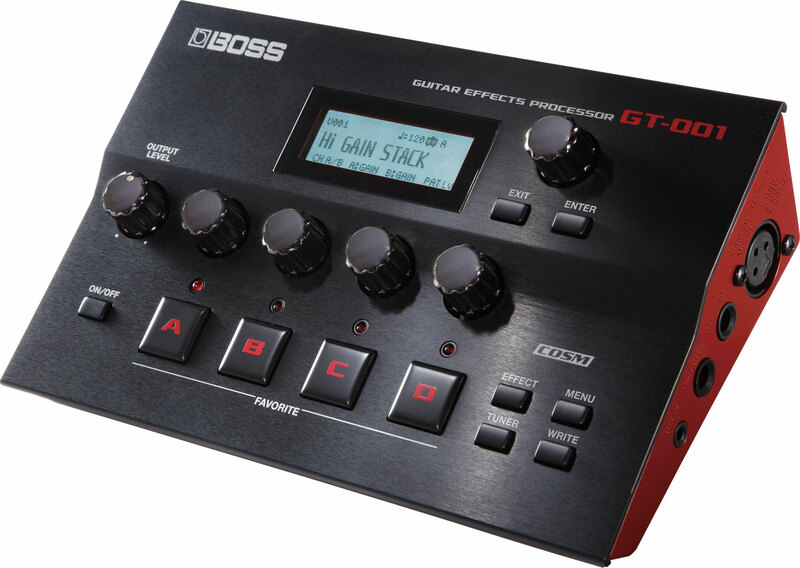 These premium patches also work with the GT-100 Version 2.0, and can be easily customized with the editing tools available in BOSS TONE STUDIO. * A-DIST is available in OD/DS and in SUB OD/DS of FX2. * OVERTONE and TERA ECHO are only available in FX2. 001 Harmo Stay-4th=C GT-001 Patch Demo. 002 MS Multi Mic Amb GT-001 Patch Demo. 003 SLICING MIX GT-001 Patch Demo. 004 WALL OF FUZZTONE GT-001 Patch Demo. 005 Super Slow Gear GT-001 Patch Demo. 006 Multiband Comp GT-001 Patch Demo. 007 A-DIST&OVERTONE GT-001 Patch Demo. 008 Auto Rotary GT-001 Patch Demo. 009 ORNG ROOMY LEAD GT-001 Patch Demo. 010 EG & AG MIX GT-001 Patch Demo. 011 Divid Organ Tone GT-001 Patch Demo. 012 Dbl Crunch 4Hum GT-001 Patch Demo. 013 Retro Funk GT-001 Patch Demo. 014 Jazz Sim GT-001 Patch Demo. 015 Comp Crunch GT-001 Patch Demo. 016 ST German Hi GT-001 Patch Demo. 017 BGNR LEAD GT-001 Patch Demo. 018 Sync Tremolo GT-001 Patch Demo. 019 Tera Echo GT-001 Patch Demo. 020 Bluesy Ld GT-001 Patch Demo. 021 Fat 60s GT-001 Patch Demo. 022 Multidimensional GT-001 Patch Demo. 023 Tera E Ld GT-001 Patch Demo. 024 Auto Rate GT-001 Patch Demo. 025 Wave Pedal SE GT-001 Patch Demo. 026 Ducking Dly&Vib GT-001 Patch Demo. 027 Humanizer SP GT-001 Patch Demo. 028 Gunya Gunya GT-001 Patch Demo. 029 70s Funky Clean GT-001 Patch Demo. 030 Seq Clean GT-001 Patch Demo. 031 ORGN Crunch GT-001 Patch Demo. 032 AC Sim Straight GT-001 Patch Demo. 033 Add Transparency GT-001 Patch Demo. 034 Brown Sound GT-001 Patch Demo. 035 Layer Sound GT-001 Patch Demo. 036 Slapback Echo GT-001 Patch Demo. 037 Vintage & Mdn GT-001 Patch Demo. 038 5th PS Gate GT-001 Patch Demo. 039 Tera Reverb GT-001 Patch Demo. 040 Touch & Go GT-001 Patch Demo. GT-001 Overview Take a guided tour of the GT-001 Guitar Effects Processor. GT-001 Steve Lukather Demo Steve Lukather shows off some of his custom GT-001 patches. GT-001 Gundy Keller Demo Gundy Keller shows off some of his custom GT-001 patches. GT-001 Alex Hutchings Demo Alex Hutchings shows off some of his custom GT-001 patches. GT-001 Stuie French Demo Stuie French shows off some of his custom GT-001 patches. This is the latest version of operating system for the GT-001. After downloading and extracting the compressed file, please refer to the “GT-001_System_Update_Procedure” pdf document included for the update procedure. GT-001 Driver Ver.1.0.0 for Windows 10 This contains information on the GT-001 driver compatible with Microsoft Windows 10. GT-001 Driver Ver.1.0.0 for OS X 10.11 This is a driver for using the GT-001 on OS X 10.11. BOSS TONE STUDIO for GT Ver.1.1.0 for Windows This is the BOSS TONE STUDIO download page for the GT-001/GT-100 Ver.2. BOSS TONE STUDIO for GT Ver.1.1.0 for Mac OS X This is the BOSS TONE STUDIO download page for the GT-001/GT-100 Ver.2.